A couple of months ago (queue right hand side-bar), I thought I'd nominate myself for the Cosmopolitan Blog Awards. Having no idea what I'd even entered myself in for, a month or so later I found that my blog was short-listed! I'd like to say a BIG thank you to anyone who voted! It completely stunned me, after a few weeks - I am still not quite over it. 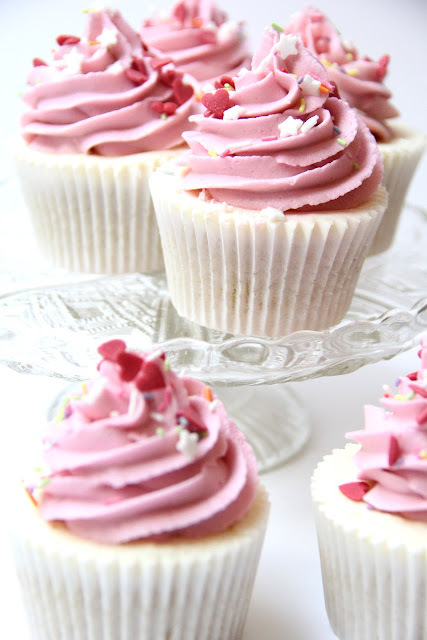 Cosmo is where the inspiration stemmed from for the colour of these cute-sy Wilton 1m cupcakes. So if you'd like to vote for me, please dont hesitate in clicking here or on the top right hand side. Or if you already voted for me to be short-listed I'm going to take this small blogging space to say an absolutely grand -spanking HUUUUUUUUGE thank you, it really means the world! Such pretty cupcakes, perfect for a little girl's birthday. I love the shade of pink on the frosting. Congrats on the Cosmo shortlist! Thank you Jo! I think the girl was pleased, and that shade of pink deffo has a wow factor!